Some merchants may ship orders through a third party's account. Channels like Overstock and Wayfair may allow merchants to ship orders through their shipping accounts. Wholesale customers can be billed directly in a separate third-party billing configuration. The process below must be enabled in the Admin tab by your ShipBridge Administrator or SellerCloud Support. We strongly encourage using this new interface for configuration. The process is identical for UPS, FedEx, and DHL carriers. 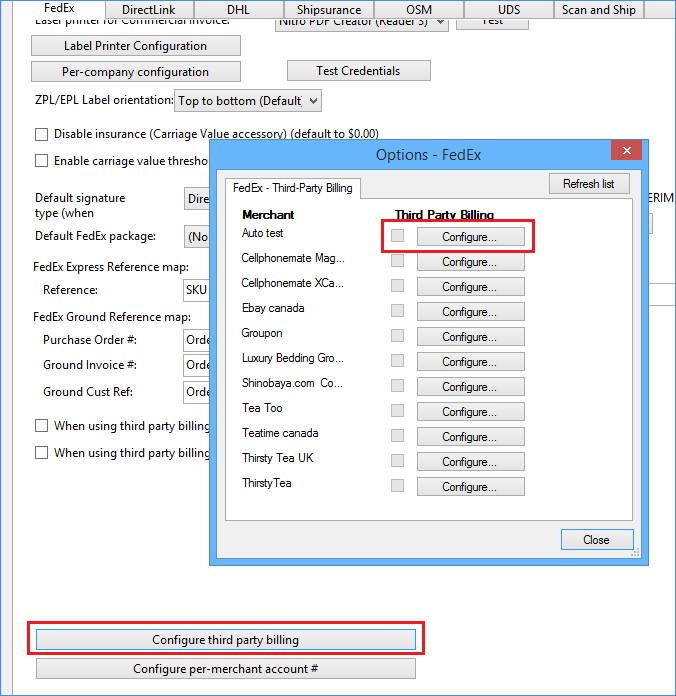 In ShipBridge, click Menu > Options > Carriers tab > Configure third party billing. Click the Configure button next to the company for which you are configuring. Select the channel for which you will bill the shipment of orders to the third party. For example, Overstock. Enter the third party's account number. When configuring third-party billing for Overstock and Wayfair, enter a partner ID (they will provide). This is not required for other third-party billers. Select the checkbox next to the channel to enable third-party billing for that channel. If the box is not checked, the default account will be used. Enter a third-party address that will appear on the label for those orders. If the label is set properly for third-party billing, it will appear there. For FedEx, this is the top-right corner. See FedEx example here. For UPS, it is the bottom left part of the label.